Century Cycles Blog: Adult Trike Fever! Two wheels feel a little unstable? Then go for three! That's what a lot of people are doing -- at Century Cycles, we've sold a year's worth of adult trikes in just the past two weeks. 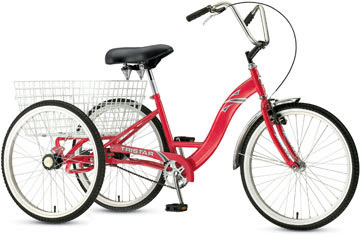 On the Torker Bicycles Tristar Adult Trike ($539.99), you can ride to the grocery store, tool around town, or go visiting the neighbors. Made with a durable steel frame and tough wheels, the Tristar can haul your groceries, library books or just an extra jacket. The wide, comfy saddle makes riding a pleasure and the simple coaster brake with an extra hand brake makes it safe. Other uses for trikes? Well, Google has them, and Scott has been known to ride one in a parade! Come test ride a trike for yourself (or a family member) and see why so many people have trike fever!